Where do I use my Jacamo voucher code? Choose your code from NetVoucherCodes, copy it and then follow the link to the Jacamo website. Find the items you wish to purchase and add them to your bag. Once you have your items in your bag visit the shopping bag page by clicking the bag icon in the top right-hand corner of the page. At the shopping bag page, you will find an ‘Add promotional code’ section below your items. Enter your code here and click ‘Apply’. Your order total will then be automatically updated including any discounts you have received. Jacamo is the number menswear brand on the high street. Not only does it offer flexible payment and delivery options, an unbeatable range of branded products- including those in hard to find sizes- Jacamo also has just about everything you need to stay looking fresh and fashionable every season and occasion. Shop from a vast range of clothing including shirts, jeans, trousers and more to create casual daywear, smart office attire and the perfect date night styles. Check out the Jacamo sportswear category and kit yourself out with football and rugby gear as well as low key loungewear that’s ideal for gym sessions, runs and generally relaxing. From trainers to track pants, sport's socks and more Jacamo has everything for your sporting wardrobe. Unlike other retailers Jacamo stocks sizes and lengths designed especially for large and tall men. So if you are a large shoe size and usually struggle to find styles you like, that actually fit, Jacamo has the shoes for you. As well as a grand footwear selection with sizes available up to a 15, and extra wide shoe widths too, Jacamo also offers multiple clothing sizes that you won’t normally find on the high street, so no matter what your shape or size might be, you can stay looking on trend. There are many ways to enjoy instant savings at Jacamo. Not only are price tags already extremely affordable they’re also ever-changing, with great multi offers that are regularly added as well as seasonal discounts that you’ll find throughout the year. Then there’s the great sale section, here you’ll find price reductions and percentage discounts on multiple items, which can be made even bigger when paired with a money-saving Jacamo discount code from NetVoucherCodes. 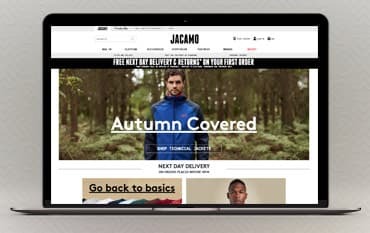 To get news, offers and deals delivered straight to your inbox sign up to the Jacamo newsletter and never miss out on a bargain again. In the Jacamo sale, you can find a variety of discounted fashion for men including coats and jackets, footwear, jeans, polos, shirts, sportswear and tees. Shop through sizes small, medium, large, extra large and much, much more to discover clothing that’s perfect for you and even more affordable than the already low-cost price tags at Jacamo. As well as sale items you can also discover multibuy offers in the outlet section including 2 for £20 on graphic tees and 2 for £40 on jeans. All the clothing and footwear available in the Jacamo sale is from huge name brands that you love and can trust including Dr Martens, Hunter, Under Armour, TOMS, Puma, Reebok and New Balance, so you can still enjoy fantastic quality and style while maintaining a low budget! A good suit can transform you from a 5 to a 10 so it’s crucial that you find a well fitted, stylish one that’ll stay fashionable for years to come. At Jacamo there’s a great selection of suits and waistcoats available as well as shirts, smart shoes, cufflinks, ties and bow ties. Whether you’re looking for an everyday suit for work, a super smart two-piece for special occasions or a classy selection of suits for special occasions like weddings or the races, you can find it all at Jacamo with tons of slim fit, long and new in suits available. Not only are all the suits at Jacamo stylish, they’re also made with the highest quality, while remaining extremely affordable, so you can make sure you look sharp for less. You can return most items for any reason, with some exceptions. Unless you have told Jacamo you wish to cancel your order, you must return it to them within 28 days of receiving it. To find the opening times of a Jacamo store near you use the store finder. Jacamo is the go-to retailer for every guy, with male apparel for just about every occasion including sportswear, nightwear and suits in sizes small all the way up to 5XL. At Jacamo you can also discover accessories and footwear as well as tons of must-have fashion from big name brands like Adidas, Nike, Vans, Lacoste, Levi’s and more. You can save money on all these brands and fashion items with a Jacamo discount code, so whether you’re looking for everyday work wear, on-trend staples, classy suits or casual loungewear you can find it all for less, in any size. We are constantly on the hunt for first order Discount Codes for Jacamo to help you with your money saving. Our experts check dozens of sites for secret codes including NHS discounts, student sites & social media channels saving you time & money!